Many home cooks are intimidated by the sheer size and heft of the Thanksgiving turkey. How do you move the 20-pound hunk into the roasting pan and then, how do you move the hot roasted bird onto the serving platter? Simple: every Thanksgiving cook needs the turkey lifter. This simple and ingenious tool is custom-made for Kitchen Conservatory, because the design works. Insert the point into the cavity (the lifter works on both stuffed and unstuffed birds) and easily lift the turkey by the breast-bone. Unlike forks, this lifter never pierces the meat. 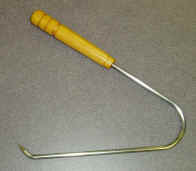 Yes, this meat lifter also works on chickens and other roasts.